Sparked by Arizona’s anti-immigration enforcement law, hundreds of thousands of protesters took to the streets on Saturday to demand congressional action on immigration reform. Carrying signs that read “Do I Look Illegal?” and “We are All Arizona,” labor, student, civil rights and immigration activists gathered in more than 70 cities nationwide (including Washington, D.C., Los Angeles, Dallas, Chicago, Milwaukee and San Francisco) with one united message—we need immigration reform now. [My arrest was] part of a response to what I consider the immorality of our broken immigration system. We were protesting the fact that hundreds of thousands of immigrant families have been destroyed … I was arrested yesterday because it was time to escalate and to elevate the level of awareness and consciousness for all those who tried to reach our shores and can’t because our system is broken … Let me tell you what I propose. I want to end illegal immigration as we know it. 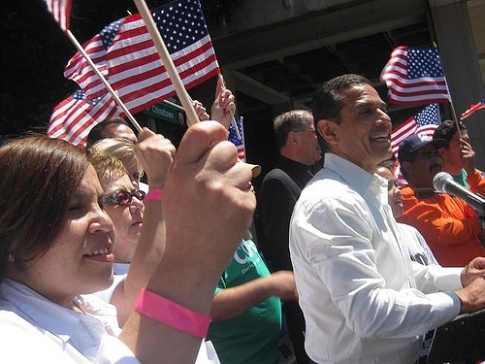 In downtown Los Angeles, where crowds peaked to around 50,000, Anna Castro, a 53 year old El Salvadorian native (now an American citizen), carried a sign that said “With Us, America Works.” Castro, a janitor, warned that Arizona’s law would create chaos if enacted in California. This is critical. It’s very important that we send a message that the kind of law that passed in Arizona cannot pass here. Immigrants helped build this country … I came here as an immigrant to work hard. We need to show that we will not permit an Arizona law in California or any other kind of state. A law like this would create chaos in Los Angeles and California. People would be scared to talk to the police. Counter-protesters were also on the scene, according to the Associated Press, carrying signs that said “We Support Arizona” and “We Need More ICE At This Fiesta.” Although lawsuits are already starting to mount challenging the constitutionality of Arizona’s new law, several other states are reported to be contemplating similar enforcement legislation. But no matter what side of the immigration issue people fall on, the protests over the weekend and Arizona’s new enforcement law remind us of one thing—our system is broken and needs to be fixed. Last week, several Senate Democrats forged ahead with a proposed legislative framework for immigration reform—Real Enforcement and Practical Answers for Immigration Reform (REPAIR). As the stakes get higher in states like Arizona, it becomes even more imperative for Congress to move forward with a fair, smart and comprehensive solution to our immigration problems.